May 30, 1956. B&O C2222 and full yard at Bethesda. Ray Mumford photo. 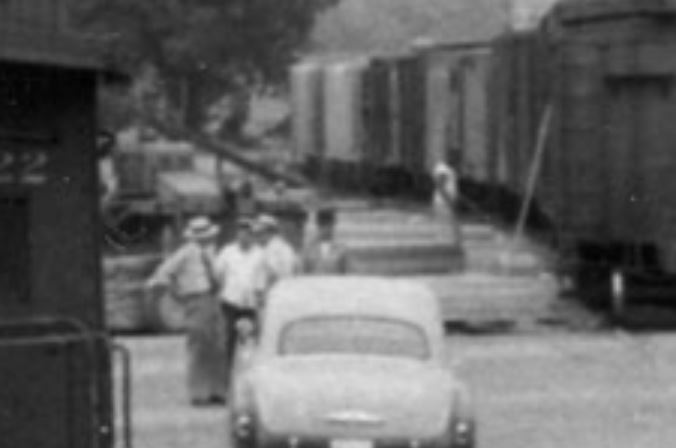 Close up view of the freight unloading. Immediately my brain triggered. “Hey! I know what that thing is! Look, do you see it? !” I exclaimed to my friend Matt, sitting next to me, looking befuddled. It’s a straddle carrier. A lumber straddle carrier. These neat vehicles were invented around 1913 and had four wheels which could turn independent of the others, allowing the vehicle to maneuver in tight spaces. The bottom is open and has arms which can grab a stack of lumber beneath it. Really brilliant. They were common in lumber yards around the country until the advent of the fork lift and palletized lumber. In some instances these vehicles are still used today and are even produced for specialized applications by some of the manufacturers who made them back then. 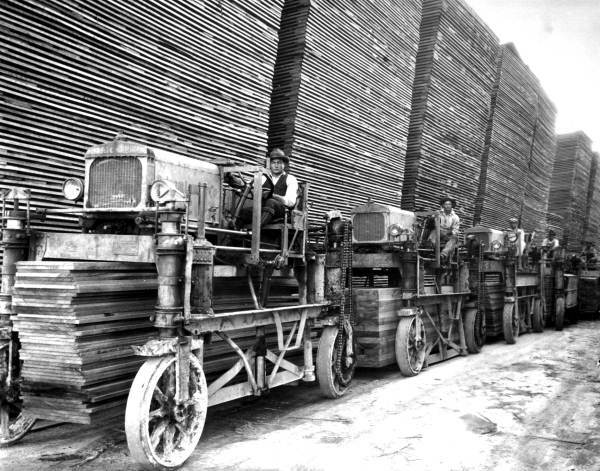 Hauling lumber with straddle carriers at Putnam Lumber Company – Shamrock, Florida. 1929. Black & white photoprint, 8 x 10 in. State Archives of Florida, Florida Memory. <https://www.floridamemory.com/items/show/24975>, accessed 12 January 2018. So why is this special? Well, it’s another fine detail that brings the setting to life. Had I never zoomed in and noticed that tiny detail, I would have never known there was one in Bethesda. It means that in my modeling of the area I can include this distinctive vehicle and it will be prototypical. I love these things. They’re quirky and eye-catching. I have no other photos that I know of showing the straddle carrier in Bethesda, so it is rather special. Well, I doubt it was used by the Einsinger Mill & Lumber Co, as they had their own siding into their yard. 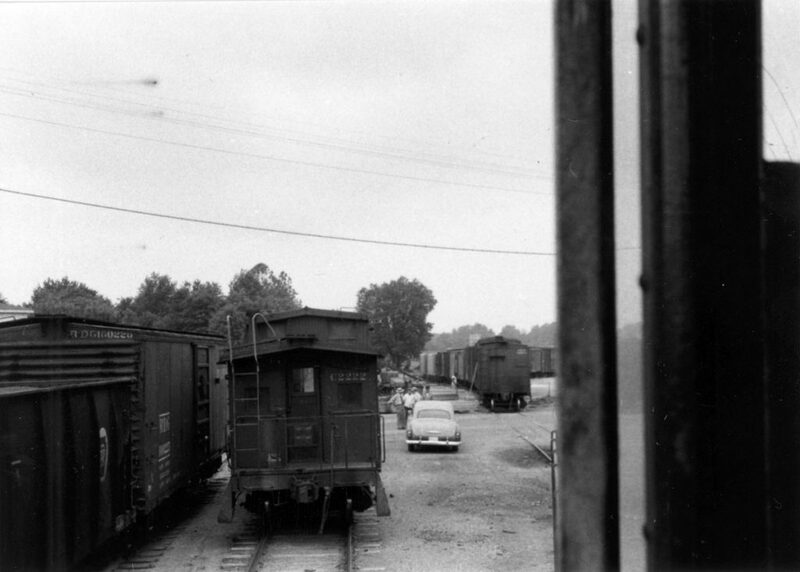 It very well COULD have been theirs, but there were several other lumber yards in the area (Devlin, for example) who may have used the straddle carrier to shuttle lumber to their yard just a short distance from the team tracks in Bethesda. 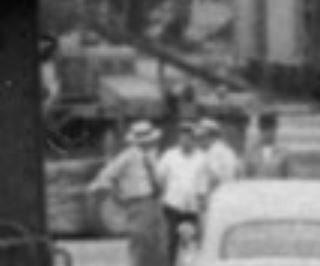 You can see a gentleman stacking lumber to the right. The lumber would be delivered by boxcar as was common at the time. The lumber would be stacked and then the straddle carrier would drive atop the bundle, grasp it and then shuttle it to the yard for storage and sale. I want to identify the make of this carrier. I have been hunting high and low for a photo or reference to the specific unit pictured in this image. Look carefully at the engine cowl, the wheels, what appears to be shrouding over the front wheel mounts up top, the rear gear assembly/cover and front opening. Also, don’t be fooled by the silhouettes of the gentlemen in the foreground, especially the one to the right. Try to crop those out. Also note what appears to be a gas tank of some sort just behind the carrier. Is this part of the unit? I can’t tell. Distance-wise, remember this this is REALLY far from the photographer in the photo. The distances are really squished together at this distance. If you have any info that could help me, please email me at cpl_clegg at yahoo dot com. These kind of details revealing themselves are the things that keep me hunting for more and more photos, stories, maps and documents related to the Branch. It intrigues me and I enjoy it tremendously! One other thing I noticed, further back, beyond the straddle carrier there appears to be a bulk transfer conveyor loader. These were seen in just about every town and it’s no surprise there was one in Bethesda. One end of the conveyor would be placed beneath a hopper and a truck would be spotted at the upper end. Once turned on, the hopper would be opened and the contents loaded into the back of the truck. Think sand, gravel, etc.